For two weeks a year, extra focus is placed on climate change with a wide range of activities for Climate Weeks in Rebild Municipality. Under the name Climate Rebild (Klima Rebild), a large number of institutions, companies, interest groups and volunteers have worked to promote sustainability in the municipality. Each spring, Rebild holds a two-week climate campaign. The campaign, Climate Weeks (Klimaugerne), aims to initiate discussions, activities and actions around climate change. Since the start of Klima Rebild in 2014, the Climate Weeks has been extended from 12 events over one week to more than 40 events spanning two. In 2018, Climate Rebild included ‘swap markets’ which welcomed over 430 visitors, an electric bike tour and a tree planting session, planting 30,000 trees in Nørager’s new climate forest. Themes for Climate Weeks have related to food, agriculture, forestry, construction and recycling – all with sustainability in mind. A central part of the project is to put climate and sustainability on the agenda in daycare centers and schools to prime the next generation for making climate-friendly choices. Recently, Climate Rebild has initiated a collaboration with The Danish Center for Environmental Assessment to measure the impact of these efforts, including life cycle assessments for a number of actions. 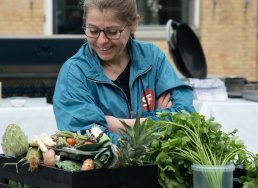 Climate Weeks’ focus on food waste and how a climate-friendly menu can look, inspiring citizens to make supper based on sustainable principles. Climate-friendly food is on the school schedule and recipes have been collated in the cookbook Climate-Happy-Food (Klima-Glad-Mad). Local restaurants are also working to limit food waste. Rebild's local companies inspire each other with sustainable production and host networking events on sustainable construction. The municipality is focusing on recycling and waste reduction. Events are held with topics such as nature conservation, agriculture and forestry. The Nature Agency and private forest owners share their knowledge about trees as a resource. Rebild Municipality is a municipality in the north Jutland region of Denmark.